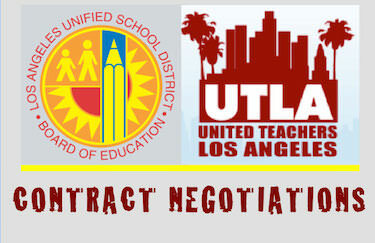 As part of its contract negotiations, the teachers union, UTLA, is asking LA Unified for a new approach to school oversight, a demand that seeks to move decisions on school management and operations into the collective bargaining process. In effect, the proposal would insinuate UTLA into areas now the sole province of the board and LA Unified administration, giving the union greater influence in how all district schools would be managed and run. While the district has not flat out rejected the request, made in October, it responded with a detailed memo last month that argues that the union’s proposed changes would violate state laws and create new burdens on the district. What this all means is anyone’s guess, inasmuch as the negotiators for the district and the union have been at it for months with little progress to show. They remain far apart in salary talks and on just about every other issue. Another bargaining session is scheduled for tomorrow. Charter school employment policies and practices, including conditions and compensation. Employee protections in charter schools regarding due process, union organizing, complaints and administrative influence. Surveys, studies and report required for consideration of any new charter or co-located school. Approval, removal and recall of charter school governing board members. Regulation of conflict of interest by charter school governing boards, employees and agents. Location of charter school governing board meetings. Charter school compliance with laws. The district said such “delegations of significant public policy and governance authority” to what is essentially a private organization raises “serious and troubling” issues that would undermine the ability to defend the changes in court. The district also cited the various laws and regulations that preclude the changes sought by the union. Sarah B. Angel, Managing Regional Director, Advocacy—Los Angeles for the California Charter Schools Association, said the association was heartened by the district response.